Improved train service is great news. It is great news for the villages of Bempton and Hunmanby as the new improved regular hourly train service on the Yorkshire Wolds Coast Railway will see all trains now call at these local stations, Bempton famous for its premier bird nesting colony, and Hunmanby as Yorkshire’s largest village with a large industrial estate close to the station. The consultation was restricted to stakeholders, I only found out by chance due to North Yorkshire County Council publishing their response on the internet. We had been promised an improved hourly service, but I was baffled how these important stops could be missed out, when all trains on the line had stopped at Bempton and Hunmanby for the past 30 years. Hunmanby station had seen the highest passenger growth on the line (90%) in 10 years, and RSPB Bempton has seen major investment, and visitor numbers rise dramatically, the train being an ideal way to arrive to minimize impact on the natural environment. The local community was alerted, and have been writing in with their views, many local people and businesses from the industrial estate, like Humprenco, who employ over 125 people on their site, our local MP Kevin Hollinrake and Scarborough Council Portfolio Holder for Stategic Transport and ICT, Cllr John Nock, along with Graham North from North Yorkshire County Council who has pressed the case for Bempton and Hunmanby to be given the hourly train service they need to access work, education, hospitals and leisure. The railway service was on the agenda at the Hunmanby Parish Council meeting, so the village can celebrate that taking the effort to write in to this consultation has had an effect and for Northern Railways, listening and promptly putting the missing stops back in their draft timetable. What we now need is a copy of the revised draft timetable so that employers on the industrial estate know well in advance what the new service will look like for travel to work opportunities. For the NHS, as Hunmanby Surgery is struggling to manage the highest level of chronic illness in the country. So an improved hourly train service to Hull and its hospitals, where many go for treatment can be promoted as a viable alternative to hospital transport, begging a lift or a tiring journey driving your car. 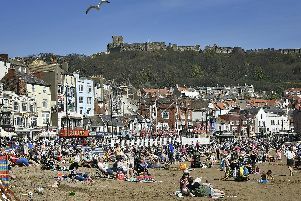 For tourism, so that local Bed and Breakfast accommodation, public houses, caravan and holiday parks locally, know well in advance of the improved hourly train service with an earlier and later train to and from Scarborough. For education, so that the higher education establishments in Scarborough and Bridlington can highlight the improved rail service to next year’s potential students. The future looks very positive for the local stations and I’m sure passenger numbers will now rise dramatically, to warrant out improved train service from May 2018.